AKRON, Ohio (WLS) -- Silence is golden. 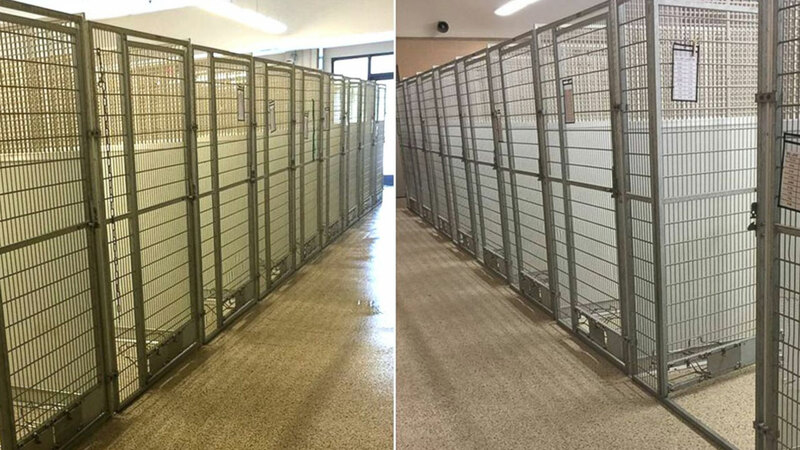 For once, the Summit County Animal Control center in Akron, Ohio was completely quiet, after the shelter managed to find homes for every single dog and cat in its care. All 93 animals were adopted out within the first 90 minutes of the shelter's 6th annual adopt-a-thon on Saturday, according to ABC News. It's the first time every animal has found a home. "The line started at 6:30 in the morning," said director Christine Fatheree. "People brought lounge chairs. By the time we opened at 10, the line was 300 people long." Fatheree credits the shelter's success to the hard work of her volunteers and communications department on the streets and on social media. "People were coming from pretty far away and I asked them how they knew about the event. Of course it was social media," she said. Among the animals who found a home were two cats who always hid in their litter boxes when prospective families came around, and an 8-year-old dog named Trixie, which Fatheree described as a "fat pit bull tootsie roll, so sweet but does nothing." Trixie went home with a law student who just wanted a dog to cuddle with at home during their studies. An elderly couple who couldn't adopt any pets made a heartwarming contribution by sponsoring the adoption of the shelter's first 50 animals. Fatheree says some new pet owners were moved to tears when they heard the news. This is Fatheree's 12th year on the job, and she says she's never been more proud. "It's not like other jobs where things can be put off," she said. "These animals can't wait. They need homes. To know I was a part of this, it is such a good feeling."